"You could go so far as to call Iapetus pre-biotic. One of the reasons we are interested in the whole Saturnian system is the fact that it's kind of a laboratory for life. The molecules that lead to the origin of life on Earth, we think formed in the outer solar system, and we are seeing them in the Saturnian system. It's colder there and these complex molecules have persisted out there as kind of a laboratory for the origin of life." 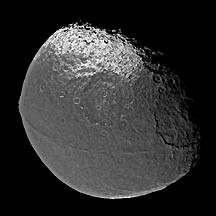 Above: Black and white Iapetus (diameter 1,426 kilometers) with a bulging "weld" around its middle. 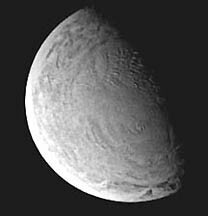 Below: Enceladus (diameter 499 kilometers) is as bright as freshly fallen snow with a bizarre, wrinkled terrain. Below: Saturn and rings imaged by Cassini spacecraft in 2004. Images credit: NASA/JPL/Space Science Institute. 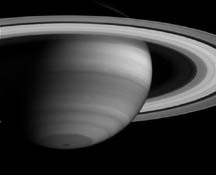 February 17, 2005 Pasadena, California - The current NASA Cassini mission to Saturn has produced the clearest pictures human eyes have ever seen of Saturn's rings, which are made out of ice and dust and iron. In addition to the rings, Saturn has 33 moons, including Titan ­ Saturn's biggest moon and second largest moon in the Solar System after Jupiter's Ganymede. Beyond the mysterious Titan where methane apparently rains down into dark lakes, Cassini has also taken the clearest images of two other moons which baffle scientists. Those moons are Iapetus (eye-AP-uh-tus) and Enceladus (en-SELL-uh-dus) from Greek mythology. The entire Saturnian system is named from the Greek dramas about gods and the universe. Saturn was the Titan who ruled over the Olympian Gods, including Iapetus. Iapetus was the father of Atlas, who carried the Earth on his shoulders, and father of Prometheus who was mankind's savior. Saturn ended up killing his father, Uranus, to become lord of the Universe. After the murder, revenging giants sprang from the father's blood. One of those giants was called Enceladus.